For seventeen years Anja Fonseca kept a painful secret. Outwardly she was the always smiling weather host at DR’s channels. When the media wrote about her, they portrayed her as the beautiful and successful woman who were just as good on the red carpet as in the bicycle sadle on the roads. But what no one knew was that Anja Fonseca since his teens has suffered from the serious eating disorder bulimia. It was out of control to a degree that it dominated everything in her life. Neither her colleagues in the DR, nor friends, family and girlfriends, were aware that several times a day she was dependent on consuming large amounts of food and sweets to escape an inner chaos of thoughts and feelings. She had to organize her days to stay undetected while giving in to the urge. Even when her boyfriends were in the next room. Even just before she went on the screen in front of hundreds of thousands of viewers. Tomorrow I stop is Anja Fonseca honest account of her obsession, loneliness and anxiety. It takes the reader back to her childhood, youth and working life at the public TV station – and until today where she – hopefully – finally has escaped the disease. 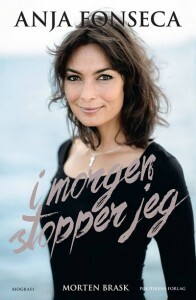 The book is written in close collaboration with Anja Fonseca’s friend and former boyfriend, the novelist Morten Brask.